Andra micht hae been biggin a bield. Andrew might have been building a shelter. having been in the past - hae. hae [he] and [hɛ] in southern Scots, also hiv [hɪv, hʌv] and [hɛv] in north east central and west central Scots. Contracted to 'v. being in progress rather than as complete - been. they can be negated by adding na. they can occur at the beginning of a question. the general properties of auxiliary verbs. They are rarely used in the subjunctive mood (the mood expresses the mode or manner of an action or of a state of being), the indicative (the mood of the verb that expresses fact) is preferred in its place. A wiss (that) his threap war soonder. I wiss (that) his threap wis soonder. The active infinitive (the subject of the verb is the doer of the action, the verbal idea being expressed without reference to person, number or time) is used in preference to the passive infinitive (the subject is the person or thing that sustains, rather than performs the action of the verb, the verbal idea once again being expressed without reference to person, number or time). He's no tae lippen til. He's not to be trusted. Is this hoose tae lat? Is this house to be let? The present participle (in or of the present tense) with the verb tae be (to be) is frequently used. *Sall is now probably obsolete having been replaced by will and sud by shoud. Daes also has the more frequent spelling dis. Some other verbs such as bide (await, stay), come, care, dow (to be able), gang (go), gaed (went), lat (let), need , ocht (ought), uise (use), want (lacking, desiring) and wit or wat (to know) may also function as auxiliaries, but that is now mostly obsolete except for need. Much as in Standard English, particularly after pronouns, is may be contracted to 's (after a sibilant consonant the full form is is used). Similarly, haed, hiv, will and wad may be contracted to 'd, 'v, 'll and 'd. Haes may also be contracted to 's, except after a singular pronoun, where it is usually haes or the contracted form of hiv, 'v. The present and past tense of the auxiliary verb be. The plural present of be is the same as for the third person singular, is or 's, after any subject except after the pronouns we, ye/you, thay where it is usually we are or we're. Similarly, the plural present of hae is haes, except after the first person pronoun we, where it is usually we hae, we hiv or we'v. The past tense of the auxiliary verb be is generally wis in the singular and plural, except after the pronoun thay, where it is usually thay war, occasionally thay wis in more colloquial styles. The windaes wis aw steekit. The windows were all closed. Me an him's no chief. Him and I are not on friendly terms. Thaim that comes first's first serred. Those who come first are served first. The lamms is oot in the pairk. The lambs are out in the field. Thay war baith ben the hoose. Both of them were in the house. Be for indicates the sense of 'want'. A'll no be for that the nou. I don't want that at the moment. A'm no for nae mair. The present habitual be [biː, beː, bɪ] and bes [biːs, beːs, bɪs], used for repeated habitual actions, is highly recessive but still occurs in Ulster Scots. It bes rainin here aft. Burns Nicht bes celebrate in Ulster. Burns Night is celebrated in Ulster. Thay be playin fitbaw on Seturday. They play football on Saturday. Fish bes selt at the mercat ilka Friday. Fish are sold at the market every friday. We bes at the dancin ilka Seturday. We go dancing every Saturday. In colloquial speech hae is often omitted after wad and shortened to 'a' after coud, haed, micht, shoud and wad. Ye wad (hae) thocht it he haed duin it. You would have thought that he had done it. I kent the days whan less wad (hae) serred him. I knew the days when he would have been satisfied with less. He coud 'a' duin it. A wad 'a' haed tae dae't. I would have had to do it. A wad 'a' coud 'a' duin it. I would have been able to have done it. As well as ability, permission is expressed by infinitive use of can rather than the old-fashioned mey, and by get tae and get plus the gerund. A'll no can gang the morn. I won't be able to go tomorrow. Ye can hae the day aff the morn. You may have the day off tomorrow. Thay gat gaun til the gemm. They were allowed to go to the match. Thay get daffin ootby till aicht in the e'en. They are allowed to play outside until eight in the evening. The schuil-bairns gets tae come ben whan it teems. The school children are allowed to come in when it rains heavily. Maun only expresses the conclusive meaning. Obligation is expressed by hae tae, hiv tae and need tae. Ye maun speir anent the job by nine. You must inquire about the job by nine. A hae tae tak the kye oot. I must take the cows out(side). Ye need tae pent the hoose. You must paint the house. A hiv tae gang tae ma wark. A need tae caw ma grannie. I must call my grandmother. She'll hae tae can lauch. She must be able to laugh. A hae tae dae't nou. I must to do it now. We'v tae be thare at sax. We must be there at six. The past tense of maun is buid, denoting a logical, moral or physical necessity. It is generally used with a personal subject and is usually followed by the preposition tae. An tae the sodgerin A buid tae gang. And a-soldiering I had to go. Will and wad are generally used where Standard English has 'shall' or 'should', except where shoud is used in the sense of 'aught to'. Bairns shoud haud thair tongues. Children ought to keep quiet. Ye shoud learn tae leuk afore ye lowp. You should to learn to look before you leap. In the first person will indicates simple future. Thay Will dae it the morn. They will do it tomorrow. She will dae that efter. She will do that later. A'll daur him dae't gin A come ower him in the toun. I'll dare him to do it if I meet him in town. Will is also used to indicate supposition. A see a body will hae been speakin wi ye. I see someone has been speaking to you. Ye will be the same lad that wis here yestreen. You are likely to be the same boy who was here yesterday evening. Sall, now generally replaced by will, indicates an intention. Sall is often shortened to s' [z] (often illogically written 'se). A s' gie ye ma warrandice. I'll give you my guarantee. 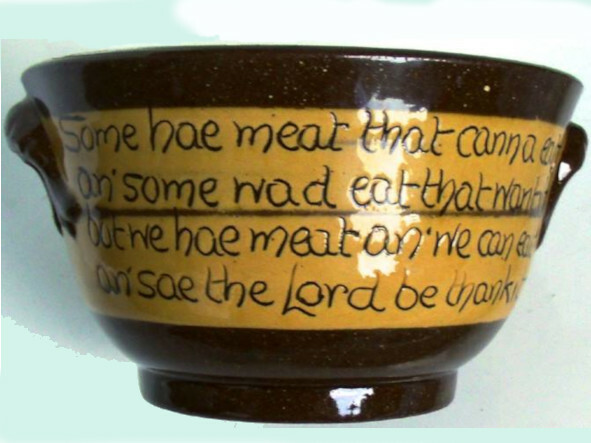 Ye s' no be here - A s' aye be thare. You will not be here - I shall still be there. South of the Forth, Scots uses many double modal constructions. He micht can come the morn. A shoud can mend the skathie. I ought to be able to repair the fence. She'll can tent the bairn. She'll be able to look after the child. He'll hae tae coud dae't. He shoud coud tak it wi him. The lad maun coud muck the byre. The horse maun can hurl the cairt. The horse can surely pull the cart. Ilka bairn in the toun will can say that. Every child in town ought to be able to say that. She wad coud milk the kye gin she ettelt. She would be be able to milk the cows, if she tried. Thay uised tae coud soum faur, but no the nou. They used to be able to swim far, but not now. The auxiliary verbs are usually negated by affixing na. Some change their spelling and/or pronunciation in the process. *Daena and haena may also take the more frequent alternative spellings dinna and hinna. Divna (do not) is an emphatic form. ** Sall and sanna are probably obsolete, having been replaced by will and winna, although will and the contracted form 'll may be negated using the adverb no. ***The negation of daur is daurna or durstna, the former usually in the sense of a 'dare' and the latter usually in the sense of a 'challenge' or 'venture'. In all persons of the plural except immediately following a personal pronoun. Where the subject is a plural noun. Where the plural pronoun is separated from the verb by some other word or words. See the verb ending s.
A dinna ken yer brither. He winna skelp the wean. He won't slap the child. He maunna tak mair aiples. He mustn't take more apples. She sanna wash the fluir. She has no intention to wash the floor. He daurna tell her he wis on the bash. He daren't tell her he was on a drinking bout. He canna heeze thon muckle stane. He can't lift that large stone (over there). 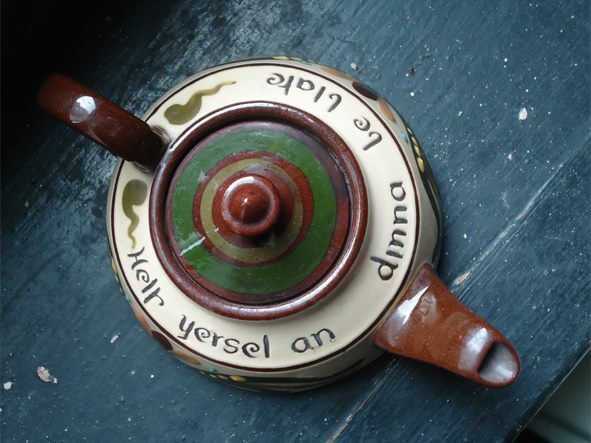 In colloquial speech daena is often shortened to dae' [de] and canna to ca' [ka]. A dae' ken wha it wis. He ca' tell ye whaur it is. He can't tell you where it is. Note daesna may also take the more frequent alternative spelling disna. A amna gaun hame acause she isna comin an aw. I am not going home because she isn't coming too. She haesna seen himm an he disna ken whaur he's at. She hasn't seen himm and he doesn't know where he is. Am and are are now usually negated using the adverb no. ** Sud, sudna and the form sanna, are probably obsolete, having been replaced by shoud and shoudna. The past tense wisna is generally used in the singular and plural except before or after the pronoun thay where it is usually thay warna, although thay wisna may also occur. A wisna gaun tae big a hoose in the winter. I wasn't going to build a house in winter. Thay warna gaun tae gie's a haund aither. They weren't going to help me either. Dinna speir at him. He michtna ken whaur't is. Don't ask him. He may not know where it is. A haedna gien the seetiation muckle thocht. I hadn't given the situation much thought. His new sark didna ser. His new shirt didn't fit. He shouldn't bother his head. A wadna eat it gin ye peyed me. I wouldn't eat it if you payed me. A coudna say a hott aboot it. I couldn't say much about it. A coudna beir tae think on it. I couldn't bear to think of it. Interrogative sentences (questions) usually begin with one of the auxiliary verbs followed by the subject unless they begin with an interrogative pronoun or adverb. b>Div is an interrogative form of dae. Wad ye like a bittock? Would you like a bit? Ye wis thare, wis ye no? You were there, were you not? Were both of them there? Wis the baith o them thare? Will ye help him caw the sheep tae the bucht? Will you help him drive the sheep to the pen? Will A gang an get ane? Shall I go and get one? Will A come roond the morn? Shall I come around tomorrow? The affirmative answer is ay and the negative answer is na or nae, or colloquial naw. D'ye want an ice? Ay thanks! Would you like an ice cream? Yes please! D'ye want yer heid duntit? Nae! Would you like your head bashed? No! D'ye ken whaur Rab is? Na. Do you know where Robert is? No. If no auxiliary verb is used, the sentence may begin with a verb. Did you come past Falkirk? Whaur gat ye yer schuilin?